We have little information on Bichitr. The only thing I could found was that he was one of the official painters of the moghul emperor Jahangir Kahn, son of the deceased emperor Akhbar Kahn the Great. During the reign of Akhbar, the paintings from the moghul empire began to take elements from the Indian indigenous art, from European art and from Persian art, creating a new tendency where realistic representations of individuals mixed with a lot of symbolic elements. Regarding Jahangir preferring a Sufi sheikh to kings, we know that the emperor Jahangir commended Bichitr a miniature album, which were usually offered as gifts. In the painting, we see Jahangir sited on a hourglass throne. Cupids write in it the wish of the king of living for 1000 years. The halo that covers Jahangir is a mix between the sun and the moon, indicating that he is the centre of the universe and that he is the source of all light. Just with these two symbols we can see the fusion that Bichitr makes between the east and the west: the cupids are purely western while the halo is a symbol purely eastern. There are 4 individuals at the left. Below we find Bichitr himself, our own artist, and this was the first time that a painter from the east included himself in his painting. This was very bold, considering that he is in front of the emperor. Here Bichitr holds a miniature and, inside it, we can see him again, deeply vowing the emperor. Above Bichitr is the king James I of England, who was copied by the artist from a painting that was given to Jahangir. 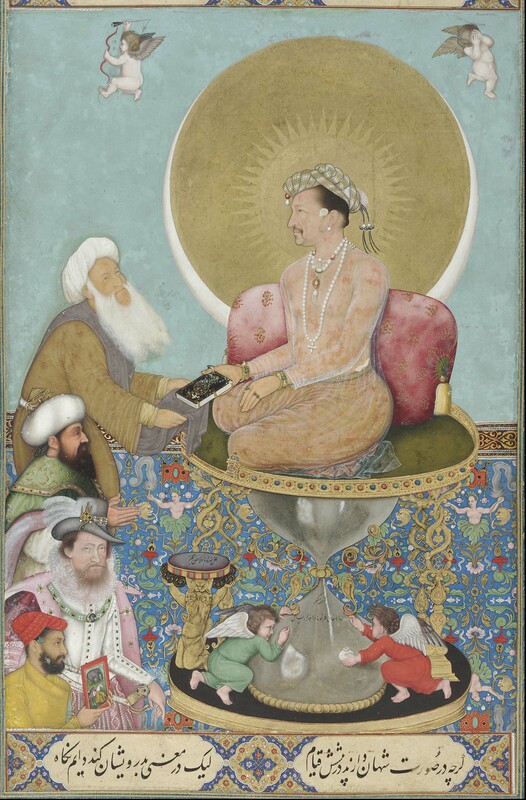 Over James I, there is a Turkish sultan and, above him, we find an old Sufi sheikh, a mystical saint that gives Jahangir a book with an inscription that says “although to all appearances kings stand before him, Jahangir looks inwardly toward the dervishes (Islamic holy men)”. Bichitr signs the work in the step the emperor uses to climb to the throne, which means that Jahangir walks over Bichitr’s name, indicating the awareness the artist has on his own lower status. ~ by Álvaro Mazzino on August 23, 2010. I believe it really is Miracle Grow which makes one only for African Violets. a slow and steady pace. This entry was posted on August 23, 2010 at 10:41 and is filed under Symbolism.You can follow any responses to this entry through the RSS 2.0 feed.You can leave a response, or trackback from your own site.